Metallic Gold latex balloons, perfect for any occasion either on there own or part of a display. With this colour used for many different events/occasions. 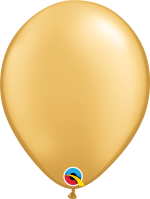 The metallic gold latex balloon is used for any occasion including anniversaries, wedding's, birthday parties, corporate events, baby showers ect. These balloons can be used for helium purpose or airfilled.